What are Calls and Puts? Calls and Puts are exchange traded option contracts that were originally designed to act as insurance mechanisms to protect financial postions. These options are contracts between a buyer and seller that give the buyer a right and the seller an obligation to buy or sell a security at a specific price (the strike price) on or before the option’s expiration date. Each option contract represents 100 shares of the underlying security. Has the OBLIGATION to SELL the security at the strike price IF THE OPTION IS EXERCISED BEFORE IT EXPIRES. XYZ stock DEC 100 calls are priced at $5.00. The call seller has the OBLIGATION to deliver XYZ stock to the call buyer anytime before the December expiration at $100 per share. If XYZ stock is trading below $100 per share on the expiration date, the call “expires worthless” and the call seller keeps the $5.00 he sold the call for. If XYZ price is over $100 per share, it will be “called away” and the call seller will have a loss as he will have to provide the call buyer XYZ stock and only receive $100 per share for it. Breakeven price for the call seller is also $105. If XYZ expires at $105, the call seller has to provide the stock to the call buyer at $100 per share and purchases the same 100 shares in the market at $105, but he can keep the original $5 received for selling the call option. XYZ stock DEC 100 puts are priced at $5.00. The put seller has the OBLIGATION to sell XYZ stock to the put buyer anytime before the December expiration at $100 per share. If XYZ stock is trading above $100 per share on the expiration date, the put “expires worthless” and the put seller keeps the $5.00 he sold the put for. If XYZ price is below $100 per share, it will be “put to the put seller” and the put seller will have a loss as he will have to sell XYZ stock to the put buyer and have to pay $100 per share for it. Breakeven price for the put seller is also $95. If XYZ expires at $95, the put seller has to purchase the stock from the put buyer at $100 per share and sell the same 100 shares in the market at $95, but he can keep the original $5 received for selling the put option. Options lose value as they get closer to expiring. This time decay, or THETA, accelerates in the final thirty days of the option contract’s life. Buyers of options are fighting time decay. 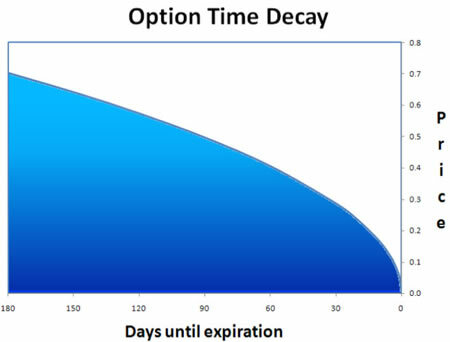 Sellers of options benefit from time decay. If a security has a fast move in the correct direction the option buyer will have the advantage. If the price movement is UP, call buyers benefit. If the price movement is DOWN, put buyers benefit. 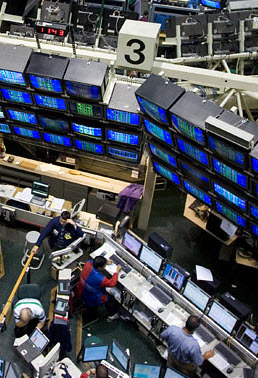 If a security moves slowly or trades in a range, the option seller has the advantage. Options with strike prices closest to the current underlying security price change in value the fastest. If you do expect a security to move, avoid options far “out of the money”, or far above the current price for calls or far below the current security price for puts. Options are leveraged and can expose you to significant risk. Sellers of calls have unlimited risk if the security price moves up. Sellers of puts have nearly unlimited risk if the security price moves down. Always strive to limit your risk either through the strategy or using conditional orders at your broker. Conditional orders may not help if the underlying security gaps up or gaps down in price. It is often best to establish limited risk option positions as an option seller using combinations of option trades, or spreads, to limit your risk. This avoids price gap risk of the underlying security. I hope this answers your basic questions about calls and puts. I’ll be adding more articles expanding how to use calls and puts together in spreads and in combination with the underlying security. Don’t forget to subscribe to our blog via the RSS or email subscription.